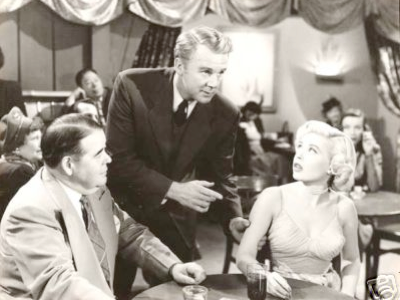 While Scene of The Crime is a stunningly average, if acceptably entertaining film noir, it is notable for being one of the few films of the genre produced by Metro-Goldwyn-Mayer and for being one of the only film noir to star Van Johnson, both known more for their war films, musicals, and romantic comedies. The rough equivalent today would probably be Tom Hanks starring in a dark, moody thriller (maybe this is why the film version of The DaVinci Code landed at the box office with such a resounding thud). At the end of the day, what SotC proves is that MGM and Johnson probably should have stuck with what they knew best, and left noir to the likes of Warner Brothers, RKO, and the poverty row studios. The movie opens on two young lovers, hiding themselves in the shadows of a darkened street, catching one last embrace before they head home for the night. Their bliss is interrupted, however, as a confrontation between two men also on the street ends with one dead and the other hightailing it out of the area in a car driven by an accomplice. It turns out that the dead man was a police detective named Monagan, and no one–neither his captain or his ex-partner (who bounced him from the homicide beat because Monagan was showing his age and slowing down) knew what he was doing wondering down that dark street. The only clues that his ex-partner (a detective named Conovan, played by Johnson), assigned to investigate the murder, has to go on are the recollections of that young couple–they didn’t get a good look at the perp, but they remembered that he had a large splotch on his face, and a severely twisted hand; also, the getaway car driver called the shooter “a crazy lobo”. The street also happens to be the location of an illegal gambling parlor; we find out that there have been a string of robberies of bookie joints, clip shops, and similar illegal enterprises. Needless to say, the local crime syndicate is unhappy. So far, so fine. Sounds like a pretty standard noir setup. Unfortunately, from here on out, serious flaws appear inScene of the Crime which ultimately make it a mediocre film noir at best. First, MGM can’t seem to leave melodrama behind–the top cops think that Monagan was dirty and was pulling double duty guarding the gambling parlor; we get to see Monagan’s teenage son make an impassioned plea to Conovan to clear his father’s name. Further, we have to see Conovan’s stressed home life, where his poor wife Gloria (Arlene Dahl) continually has her dinners, movies and sleep interrupted by emergency calls to her husband. Also, she’s deathly afraid that he’ll leave one night and end up as a stiff in the morgue. As if this bit of family drama wasn’t enough, it soon becomes apparent that the writers at MGM needed to watch a few of their competitors’ films noir in order to figure out the basic conventions of the genre. For instance, we see the local crime syndicate pick up one of the guys that they suspect has robbed them; followed by the cops, they take him to an abandoned warehouse where a bookie IDs the guy as one of the stickup men. Actually, to back up the step, before “lineup” the mobsters invite the cops in to observe. Then, once the syndicate has the man who ripped them off, they let him go without so much as a stern warning. The absurdities and pointless melodrama pile up, one upon another, as the film proceeds. The “twist” ending sounds like it was cooked up by a five year old who couldn’t think of any other way to end his story. Scene of the Crime should be of interest only to those trying to acquire a complete knowledge of the limited number of films noir produced by MGM. Instead, seek out the best film noir produced by that studio, The Asphalt Jungle.